Food for the Body & Spirit, a cornerstone program of the Black McDonald’s Operators Association (BMOA), has a 15+ year history of feeding and uplifting Chicago’s underserved communities. FCG’s goal was to reenergize the effort by expanding its footprint of goodwill. A strategic communications campaign with various consumer touch points helped McDonald’s to create a winning recipe for not only “Lovin’” but serving — the community. Stakeholder engagement, media relations, advertising, and social media were key elements of the campaign. Stakeholder engagement created grassroots partnerships that expanded the program from several hundred pre-Thanksgiving breakfast meals at neighborhood churches to a weeklong food giveaway at five McDonald’s locations. Events featured full Thanksgiving meals – turkey and all the fixings –to feed the body and an inspirational gospel concert to feed the spirit. Celebrity volunteers, former Chicago Bear Matt Forte and Bryshere Gray, star of the #1 Fox TV show, Empire, helped drive media interest and support. FCG leveraged advertising and media partnerships to secure store remotes, live broadcasts and gospel artists who performed at the events. Event details were shared by community partners, celebrity ambassadors and gospel artists on their social channels. 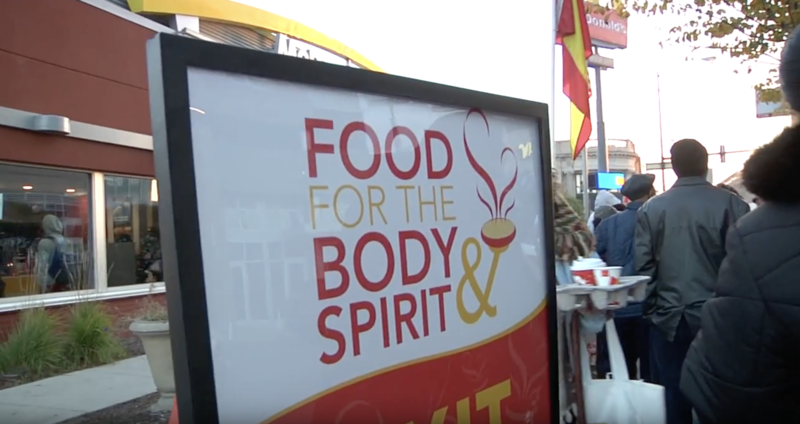 FCG exceeded all the objectives for the enhanced Food for the Body & Spirit program. The number of meals served were increased by 100%, reaching 1,000 more families. FCG generated 2.5M earned media impressions – the highest impressions total in program history. Coverage included placements on all major Chicago TV outlets as well as digital news platforms and community press. Food for the Body & Spirit also led to increased, sustained consumer engagement as demonstrated by the many testimonials shared directly with the BMOA.